Colorado's Great Seal statute, CRS 24-80-901, is in the news after lying dormant for 131 years. Legislators have barely noticed the seal during those years, and its mysteries have remained unanswered. The bill currently before the legislature, HB 1048, by Rep. Ray Rose, changes the diameter of the seal by a quarter of an inch reduction. Because the bill is limited by its title "Concerning the Size of the State Seal", it unfortunately, cannot address the seal's content. Some of that content is as fresh as it was in 1861, some of it could use some work, and one item may have meaning that has been entirely lost to history. On Nov. 6, 1861, the first Territorial Assembly of Colorado passed a law creating Colorado's circular Seal bearing the Latin motto "Nil Sine Numine" in black letters on a white background. The language has two possible interpretations according to Colorado documents. Its meaning could be taken as "Nothing Without Providence" or as "Nothing Without Deity". The Oxford Illustrated Dictionary definition of "deity" (regard as a God) doesn't include "providence", but the definition of "providence" includes "God". The creation of a seal gave the new territorial government credibility and signaled the presence of an orderly government. Although the Territorial Assembly wanted credibility, it didn't yet want statehood. Territorial status had one advantage over statehood: The federal government instead of the local population paid the cost of government. "There shall be a seal of the state, which shall be kept by the secretary of state, and shall be called the 'Great Seal of Colorado'. 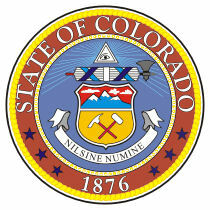 The seal of the territory of Colorado as now used, shall be the seal of the state, until otherwise provided by law." In 1990, the Great Seal was one of the subjects of a successful constitutional amendment that I drafted to remove or repair obsolete provisions of the constitution. A section of the amendment struck language referring to the "territorial" seal and gave the legislature authority to change the Great Seal's form. I asked House Speaker Bev Bledsoe, R-Hugo, to be the chief sponsor of the amendment and made myself "second banana." Under the authority of the 1877 statute, the seal's Latin "Sigillum Territorii Coloradenesis" (meaning "seal of the territory of Colorado") was changed to English "State of Colorado." The date on the seal "1861" was changed to "1876" and there was nothing next to the number "1876" at the bottom of the seal. In 1861 as in 1877, at the very top of the Great Seal is "the eye of God" enclosed within golden rays thrusting into the lines of an outer triangle. On the back of a $1 bill with the portrait of President George Washington, you will find the same "eye of God" on the left hand side. This apparently comes from Freemasonry. Directly below the triangle is the Roman fasces bearing upon a thin tying band of red, white and blue, the words "Union and Constitution." Colorado Territory was showing where it stood in the Civil War. The Roman fasces during the Roman Empire consisted of a bundle of wooden rods, with an axe head hanging down from the bottom of the bundle. Ours more resembles a spear entering on the left of the bundle and an axe head coming out of the right. The fasces is a visual metaphor for the idea that a stick by itself can easily be broken, but a bundle of sticks tied together is hard to break. Benito Mussolini, dictator of Italy from 1922 to 1943, chose the fasces as the emblem and namesake of the Italian Fascists. You can't blame the Colorado territorial legislators for that. Mussolini wasn't born until 1883. Below the fasces is a heraldic shield that is as up-to-date as if it had been created in 2007 instead of 1861. At the top of the shield are three snow-capped mountains, even higher than clouds against a red background of Colorado soil, which shows off the mountains much better than blue sky would. It's an excellent reminder to tourists of why they visit Colorado. Below the clouds, separated by a thin yellow line, are a pickaxe and sledgehammer of a miner. They lie partly on golden ground and partly on brown soil. Mining gold, silver and coal offered the potential to make the territory and young state rich -- just as mining oil, gas, and oil shale, if equitably taxed, could be the salvation of Colorado's economy today. And below the heraldic shield is the state motto "Nil Sine Numine." Lying atop the red inner circle of the Great Seal as of March 15, 1877, are the words "State of Colorado" in gold letters. At the bottom, six stars, three on each side, flank "1876" in gold numbers. The stars were not in the territorial seal, nor in the Great Seal, as described in the 1877 statute, now numbered CRS 24-80-901. Nor can anyone say for certain exactly when, years later, the six stars were added. Our statute doesn't mention the six stars. Are they just decoration or do they have meaning? In 1958, the Denver Post printed a story about a group of young students being shown a copy of the seal at the state museum and asking what the stars stood for. No one knew what the stars stood for, or where the stars came from, even after the newspaper did weeks of research. And the stars are still there in 2008. Perhaps another bill can be introduced to add the stars to the statute, since the bill by Rep. Rose cannot be expanded. And for those not versed in Latin, perhaps the statute can state in parentheses the motto's meaning in English.